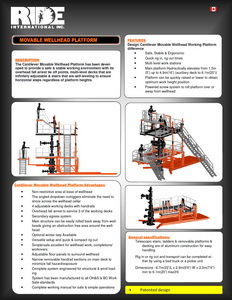 These Movable Wellhead Platforms have been developed to provide a safe & stable working environment for workovers or completion duties. With their overhead fall arrest tie off points & decks that are infinitely adjustable for ergonomic wellhead access. They also include telescoping stairs that ensure horizontal steps regardless of platform heights. Click on the image below to open the brochure for more information.